Antique sewing machine - Gresham treadle 1. Manufactured by Gresham & Craven, Manchester, England, during the 1870's, this lockstitch machine is featured here together with its dedicated ultra-rare treadle. In its hand-only form, the machine sold for £4.4s.0d. 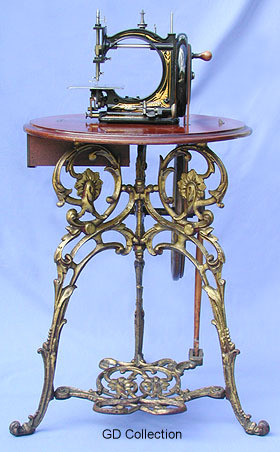 The treadle combination with polished walnut table cost £5.14s.0d.